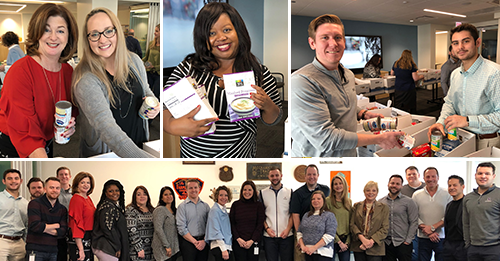 For the tenth year we’re celebrating Thanksgiving with Chubb by preparing 52 Thanksgiving dinner boxes to donate to families in need. Weinstein Meats generously donates the turkeys, and Chub brings the traditional Thanksgiving sides. The boxes are picked up by two of our non-profit Clients, New Star and Sertoma Center, who will distribute to families whom they service. We’re spreading the holiday love further by partnering again with Weinstein Meats to help them play Santa to the Austin neighborhood through their annual toy drive. Our donation will help put smiles on the faces of children at Leland Elementary School.